This special backup power supply for gas heaters and gas water heaters is ideal for locations with poor power quality or regular power cuts. 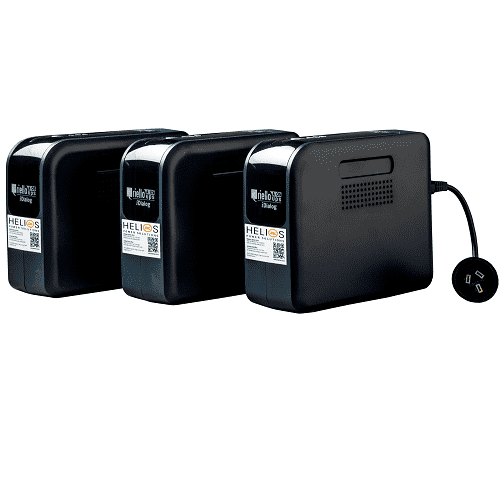 Like the uninterruptible power supplies (UPS) used for computer and alarm systems, it automatically switches to a rechargeable maintenance-free battery whenever there is a power blackout or brownout. Why do I need backup power for gas systems? Gas heaters and gas water heaters often require electrical power to provide the spark for gas ignition, as well as running an electronic controller and small internal fan. In the event of a total power failure (blackout), as there is no electrical power available to ignite the gas, there simply will be no heat or hot water. 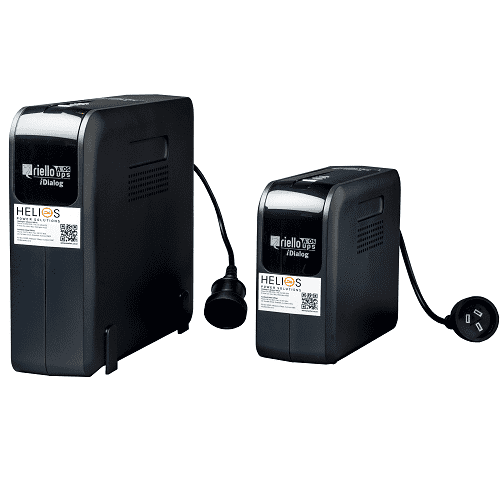 The Helios Power Solutions SPS 320, apart from cleaning the power, charges its own batteries, keeping them ready for the next power failure (blackout or brownout event). This unit must be installed in a dry environment, so an electrician may be required to instal a new power connection inside the building, or a weather-proof enclosure which needs to be larger enough to allow for cooling. The back up time depends on the type of controller installed but is typically as stated in the SPS320 brochure. The controllers only require power when the gas is flowing, that is when the hot water is being used. When there is a power failure these units will also switch off automatically after 1 hour if there is no load. During a power cut battery life can be further extended by switching the SPS320 off at the wall when you have finished running the hot water and switching it back on again when required. If the anti-frost system operates in the water heater, the battery will discharge faster. The battery will be automatically be recharged once the power returns. is connected, at which point the generator power will be supplied to the gas appliance and also recharge the SPS320’s battery, if desired. Please ensure that the maximum output voltage of the generator does not exceed 276Vac. Typical battery life is about 3-5 years. It is recommended that the SPS320 be tested every 12 months to check that the operation is still satisfactory by turning the input power off and running the hot water. Multi Control and Multi Flexible. Minimum impact on mains – easy source. Output voltage:208 VAC - 3F. Applications: airport, military and naval. Configurable addresses from 0 to 99. Data format: Profidrive V2 PP05. Communication speed configurable from 9,6 kBit/s to 12 MBit/s. High visibility LCD with graphic functions. Management of three independent serial lines. Port configuration for Modbus / JBUS as RS232 or RS485. Suitable for integration with the main BMS management programs. Firmware upgradeable via serial port. Port configuration for MODBUS/JBUS as RS232 or RS485. Management of two independent serial lines.